Sunny Meade Alpacas, Ltd. is a farm located in Swanton, Ohio owned by Julie Bodette Verhelst & William Verhelst. We offer classes in our FeltLOOM studio! Over the years our farm has continued to evolve. We invested in a FeltLOOM and built a fiber studio in the barn. We've make wonderful products from our herd's fiber, along with teach classes to educate the public in regards to fiber usage. We can also help fellow breeders create products of their own to boost farm profits. Check out our FeltLOOM studio and class offerings under "other services" website page. We LOVE sharing our passion for alpacas and their fiber, spreading the word that alpacas are more than darling pasture ornaments! Celebrating 19 Years in the Business! While providing graphic design services for a new alpaca breeder, Julie fell in love with a one month old cria. Having grown up on horse farms, she knew the joy of raising livestock. As they say, the rest is history. Sunny Meade Alpacas, Ltd, located in Northwest Ohio, focuses on the breeding of high-quality, award winning huacaya alapcas. Having acquired a base herd offering some of the top bloodlines in the industry, the farm is proud of its breeding program, which continues to deliver quality time after time. 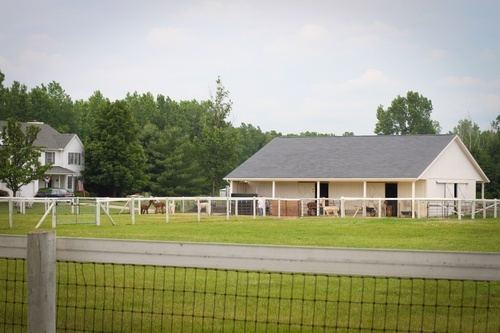 Alpacas are a lifestyle at Sunny Meade, not just an investment. Experiencing the joy of caring for and interacting with the alpacas is what makes the business so rewarding. People ask, "Who buys alpacas?" I always say, "people like me." Not everyone has to get it. I believe that there will always be someone that will see your excitement and enthusiasm and will want it for themselves. Our newest addition is X-Phactors Pharoux born October 2, 2017. We're very excited about his future. Beloved Son of Thunder, "Sonny" continues to make appearances all year long. Even as a herdsire he has an incredible gentle disposition! Visit his "Sonny Alpaca" Facebook page to keep up on where he's going to show up. 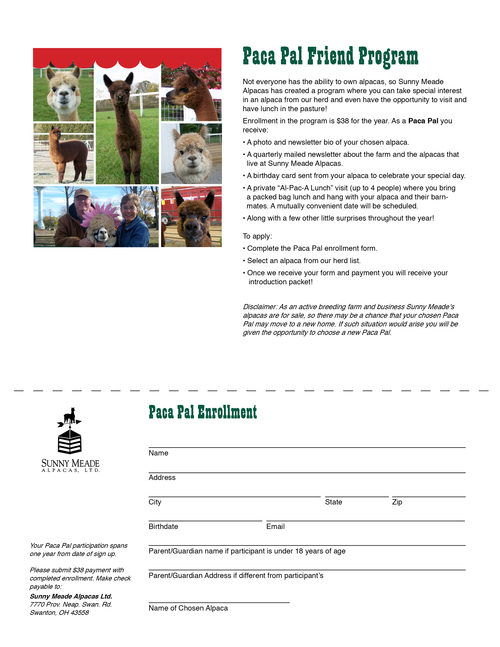 Contact us to receive our latest InFARMation newsletter or alpaca info packet. If you have any questions about the alpaca lifestyle or have a need for graphic design, feel free to call. Or better yet, plan a visit!